Upmarket yet informal neighbourhood small-plate dining with plenty of touches both 'current' and global. 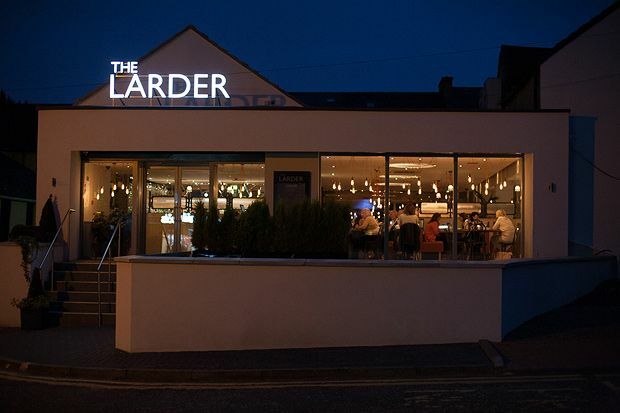 The R Group have venues in Lenzie, Milngavie and Bishopbriggs already – so they know a bit about staying abreast of dining trends while maintaining custom from the locale. With The Larder one feels these opposing forces at work. Small plates (‘Yard’, Field’, ‘Sea’, ‘Garden’) and the influence of a couple of Finnieston restaurants feel about right. But the rhythm is more relaxed, more Bearsden. Scallops are completely correct – the beginnings of pan-fried crispness on the outside, giving way to soft, plump, sweet flesh, with cauliflower (fried little crisps, and puréed) underpinning things. Pork belly has tons of juicy, fatty give, offset by super sharp crackling. There’s just a slight lack of a bold ingredient or stronger seasoning – a competent kitchen torn between caution and overreaching perhaps. Dishes described by their ingredients can intrigue or frustrate. ‘Pulled duck, mango, coriander’, for example, is actually an unassuming bao (steamed bun), but ‘pineapple, coconut, lime’ is delightful – toasted, citrus and sweet notes mingling on a vibrant plate. There’s lots of pleasant stuff, and long, clean lines and spaciousness help the cause, too. A trip into the city is now that wee bit less necessary. Looking for events in Bearsden?